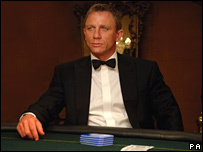 The tuxedo worn by Daniel Craig James Bond film Casino Royale is going to be auctioned off for charity. The proceeds from the online sale will go towards helping ChildLine reach their 20th birthday goal of £20m. A walk on part in US hit serial Desperate Housewives and the gold Big Brother diary room chair are also up for grabs in the auction. ChildLine's Esther Rantzen said: "Your bid will enable ChildLine to increase the number of children it helps." There are over 40 prizes going under the hammer, including a visit to the Hawaii set where US television drama Lost is filmed. ChildLine is a free, confidential helpline that operates 24 hours a day for children and young people with problems. Volunteer counsellors are trained to comfort and advise anyone who phones in. Around 4,500 children call for help each day, but 2,000 are unable to get through due to shortage of volunteers. Bidding starts from 1st December. The live will take place at the ChildLine Ball on 9 December.